Start with the swim in an inspiring – if testing – location! Mention Alpe d’Huez to professional cyclists and they’ll gaze into the abyss. Mention it to triathletes and they’ll collapse to the floor in fits of tears. The iconic Tour de France mountain is just one torturous element of a debilitating event that begins with a chilly swim in the crystal-clear waters of Lac du Verney and reaches the finish line via a 22km hilly run. As well as Alpe d’Huez, the bike also features the Alpe du Grand Serre (1,375m) and the Col d’Ornon (1,371m). For those who are looking to ease into this brutal race, there’s a short-distance offering measuring 1.2km swim, 30km bike and 7.3km run. Mind you, negotiating the memorable 21 hairpins of Alpe d’Huez remains on the menu. Fancy plunging off a boat into Norwegian waters at five in the morning? Who wouldn’t be attracted by swimming through clear, icy waters against a backdrop of darkness all within the ominous shadows of doomy mountains. Like the famous Escape to Alcatraz Triathlon, being shipped out on a ferry for the commencement of this immense challenge only adds to the tense aura. That feeling’s intensified come the run, which culminates with a 17.2km climb to its 1,850m mountain finish. If it gets that far. In 2005 and 2007, cold and snow made it unsafe to complete the final 4.7km. Still, it seems digging the mental and physical depths is in demand – in 2016, over 3,000 athletes representing 63 countries applied to race. The race maxes out at 305. In 1977, looking to settle a local argument between who was the toughest – swimmers, cyclist or runners – Commander John Collins set about organizing what would become the biggest event in triathlon. A year later, 15 men set off for the first Ironman, won by an American Gordon Haller. Fast-forward to 2017 and over 2,000 professional and recreational athletes will look to write their own chapters in the Ironman record books. 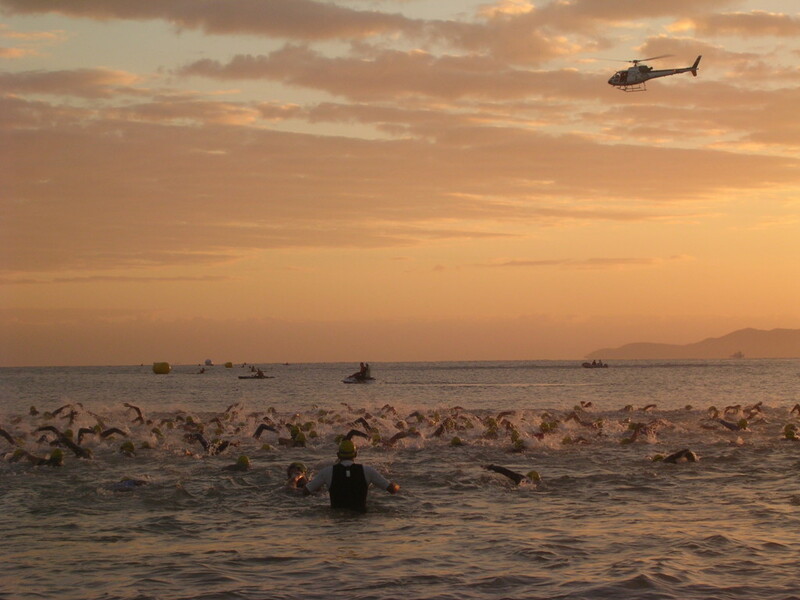 Hawaii entry’s by qualification at other global Ironman events, though a ‘lucky’ few gain entry via a Lottery. Vision triathlete Cameron Brown has twice finished runner-up in Hawaii – in 2001 and 2005 – complementing his astounding achievement of winning Ironman New Zealand a record 12 times. Not bad for a 44-year-old! Denmark’s Michelle Vesterby, who also races for Vision, recorded one of the greatest results of her illustrious career here in 2015, finishing fourth and just 4 minutes off a podium spot. Michelle clearly loves Kona, coming sixth in 2016. The Enduroman Arch to Arc Triathlon is arguably the longest point-to-point triathlon in the world, where you either race solo or as part of a relay team. The 300-mile continuous effort begins with an 87km run from London’s Marble Arch, through the beautiful Kent countryside to the white cliffs of Dover. From there, you face the cross-channel swim, which is a mere 33.8km at its shortest distance. English Channel swimming rules dictate only duck fat and a swimsuit can be worn in official swim challenges. Thankfully, Enduroman sidestep those and wetsuits are allowed. A 289.7km bike from Calais to the Arc de Triomphe in Paris completes this crazy challenge. This really is a test for the most extreme of triathletes, highlighted by the rules that stipulate you must have conquered a 6hr sea swim in waters below 16°C before you’ll even be considered for entry. So confident were the organizers of the severity of the SavageMan that in their first year, they offered a refund if it wasn’t the toughest race entrants had ever raced. Needless to say, few return transactions were required. The SavageMan 70.0 Triathlon is the flagship event of the SavageMan Triathlon Festival and, though not the longest here, features many sections that are simply gruelling. Take the Westernport Wall, a 31% gradient hill that’s lined with screaming, cowbell-ringing spectators. Or what about the crossing of the Eastern Continental Divide at Big Savage Mountain, a 7.1-mile, 1,950-feet elevation containing multiple, extended stretches approaching 20%. Many suggest this is the most severe climb in all of triathlon. We hope this has whet your appetite for the year ahead, check out some more of our favorite triathlons here. And if you’re ready for performance-enhancing, weight-saving upgrades, check out the Vision range of triathlon components.